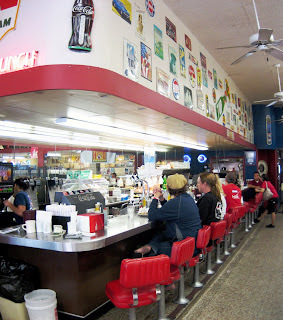 There are few places like Watson's Drug & Soda Fountain left in America, and even fewer in Orange County. So it's no wonder when movie crews and politicians need a Norman Rockwell backdrop to go with their stories of bubble-gum American folksiness, this is the place they flock to. And that's exactly what Tom Hanks did in making "That Thing You Do" -- a movie about how a small-town rock band made it big. In 1995, his film crew set up camp and used the whole of Old Towne Orange to double as Erie, Pennsylvania circa 1964. In it, he found a perfect character actor in Watson's Drug and Soda Fountain. With formica and chrome, "Liver and Onions" on special, and red checkered tablecloths with swivel stools to match, it oozes nostalgia without even trying. Both a functioning drug store and a diner, its interior is a space so eeriely classic, so suspended in a long forgotten decade, that I half expect Andy Taylor to mosey in, saddle up at the counter, and order a slice of apple pie and a chocolate malt -- which just happens to be a specialty of the house. 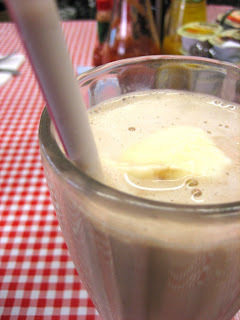 Made with Carnation ice cream, cold milk, and malt powder, this is a shake that costs $4.95. That's right. A five-dollar shake. But it's one that Vincent Vega himself would approve of. From Quentin Tarantino's "Pulp Fiction"
It's served up in the frosty metal container from the mixer, with an empty soda glass into which it's to be poured. The first sip is transcendent, full of memories and fondness. The malt -- more refined than a regular old shake -- has a nutty, milky sweetness to it; the kind of cozy flavor which transports my brain back to the innocence of childhood and warm-fuzzy recollections of watching Saturday morning cartoons in my pajamas, a cool glass of Ovaltine in my hands. And since the concoction is hand-spun to order, the consistency of the chilly brew is simultaneously creamy and icy, charmingly imperfect with miniscule pellets of frozen milk that melt on the tongue the moment it's detected. I inhaled the first glass through my straw, but realized I had another full glass coming when I poured out what was left in the metal cup. It was then that I discovered: there is such a thing as too much of a good thing. While the first glass was heaven, each successive drag of the second was exponentially less enjoyable. By the time I had sucked down half of it, my body decided it had just about enough of the malt. Overloaded, overstimulated, and overindulged on butterfat, I summoned all of my strength to suppress my body's resistance to it, and to drink the rest without throwing up. So the next time you see me at Watson's, I'll be sharing my two-serving malt -- ideally out of the same glass with two straws, as if I was in a Norman Rockwell painting myself. That malt looks so delicious. Thanks for another great post. Isn't the Orange Circle amazing? You can get gelato, milkshakes, and falafal all in the same block. Have you been to Felix's in the Orange Circle? It's an amazing Cuban restaurant, best to go during dinner because it includes their delicious soup and a pretty good tres leches cake. Hey Elmo - A nice slice of life as it used to be.....Hey it looks like Blogger's going to actually accept this comment! yay! You really live in an awesome area for eating out! Great find Elmo. And that's the best part about chocolate malts - it's like you're ordering 2 for 1! Wow, what a trip! I used to work at Watson's when I was in high school. I learned how to make a Green River, real ice-cream sodas, cherry phosphates and all kinds of other retro treats. The cook at the time was a terror named Rudy... I'm sure he's long gone, though, as he was already older than God in the late 80s. I second the recommendation of Felix -- especially for breakfast. Watson's = great malts, lousy food. Filling Station = great food, no malts. it's always a tough decision. That place looks amazing. Wish there were more of those around. How could I possible miss this place? I really need to go back to Old Town and chill for a day. Ai! Another gem in the wonderful Orange Circle. I haven't eaten around there for 5 years since I've done a high school Spanish project at Felix's, which was practically like a food blog entry! I liked the food. Mmm, I've got a canister of Ovaltine in the pantry waiting for the next time that I buy some milk. I also recommend Felix! Though, their breakfast is a hit or miss at times. Lunch and dinner seem to always be good. Be prepared to sit outdoor because seating inside is really limited. It *IS* amazing! I am slowly working my way through what the Orange Circle has to offer. Still on my list: Rutabegorz, Felix, among others. Yay! Cool! Blogger's allowing to post comments again! It's been iffy on my side too. Absolutely! This is a 2 for 1 malt. Hope the owner's at Watson's don't read this and think that I want it any other way! Wow! Cool! You worked there! Seems like a great place to be employed. The short order cook is a new guy, it seems, because he's a younger dude. By the way, I am going to have to try a Green River, and everything you mentioned. I didn't try any of the food, but it all looked Denny-ish. Sounds like my suspicions were right. Me too. We need more Old Town's and all the places that used to be there. Applebee's need not apply. It's a trip! Orange Circle's a jewel of a place. You could do a whole two days of meals without repeating. For example: Breakfast at Felix, Lunch at Rutabegorz (or Papa Hassan's), afternoon milkshake or ice cream soda at Watson's, dinner at Gabbi's. Okay, I need to try Felix for sure. I'd like to read that report by the way. It doesn't help my waistline that there's twice the amount of malt than I expected! What are you waiting for? ;-) Try a malt as an after school snack! Bring a friend though. I wondered why I had heard of this place when I saw the headline. Certainly iconic. I wouldve probably continued drinking the shake even after I stopped enjoying it to the fullest extent. They say each bite of food is typically less rewarding than the last...I find this to be the case with repetitive flavors. LOVE Watson's! Sometimes I hit it for lunch and get pancakes. They're as big as a car!!! My co-worker calls them 'gut bombs'! You hit the good ones Elmo! dude, love your phreakin writing-- makes me wanna run to that Fair Oaks Pharmacy and get one now... awesome quote from pulp fiction. Norman Rockwell mashed up with Pulp Fiction??? That is loco! I love the Orange Circle. I love that stupid movie "That Thing You Do!" too. You're right about how deceptive old-time milkshakes are. In our day, you just get a paper cup of the liquefied ice cream and that's it! Nothing else! No additional chilly stuff in the metal shaker! But at least you finished the shake. You got your $5 worth, and then some! I don't know much about Watson's, but in Phoenix, the same place is called McAlpine's. It sits on the cusp between downtown and uptown Phoenix on 7th Street, featuring a 1920s atmosphere with a lunch counter where you can get a chocolate malted and an egg salad sandwich. At lunchtime, they even feature a man walking in front of the place wearing a sandwich board with the words "for the best lunch in town, eat here!" I haven't gotten there yet, but people say it is a blast from the past. We are both lucky to have such places in our cities. You hit it right on the nose. The malt was a repetitive flavor (although a good one). That and I usually don't drink that much dairy. Candy! Didn't realize there was candy! I saw aspirin, vitamins, etc., but completely missed the candy. Dang. I try Deb. Their breakfasts look good. That's what places like these are good for: diner breakfasts and shakes. Thanks bud! Means a lot! And every time I can quote Tarantino, I do. "That Thing You Do!" and "Pulp Fiction" would make a trippy double feature. In between, of course, you need something with Kevin Bacon. "Uh Lorraine...my density has brought me to you..."
That gives me a warm feeling, knowing that Watson's is not the only place left. Every area of America should have one of these within driving distance, so that grandparents can have a place to take their grandkids and tell stories, and people like me can sit in a place I've only seen in movies. Looks thick and rich - very chocolaty - I like the photos you took. Talk about one of life's most precious treats! The Malt! Thanks for this post, ti's very great because I love chocolate. I don't know why the food is getting such low ratings, I really like the hamburgers and breakfast stuff here. I've heard great reviews, but the two times I've gone my dinners were both average. For Cuban food, I recommend Versailles in Los Angeles on Venice Blvd. I think there is one in Manhattan Beach as well. Yup. Nothing satisfies like the malt. Nothin'. Heard about Versailles...it sounds like the place to go. Too bad LA is so far (by my standards), but Manhattan Beach! Didn't know there was one there. Thanks! Wow-one of the dirtiest restraurants in O.C! The food is overpriced and extremely low quality. The ice cream is Swiss Miss which is the lowest cheapest quality in California. The toilets have crap on the floor and walls!!! ...but they do have candy!!! I ordered a "Full Rack" of ribs for only $15! 6 ribs.. I called them on it and they stood pat on what a full rack is 6 ribs! These guys are ignorant or just plain liers. bathrooms are filthy; size of the servers I hope are not an indication of how healthy the food is;the restaurant is very dirty; how dirty is the kitchen??? ?